The Federal Executive Council (FEC) on Wednesday approved $2.9billion Eurobond as part of the external borrowing plan to finance capital projects across the country. The Council meeting presided over by President Muhammadu Buhari, approved the appointment of six transaction parties to advise the Federal Government on the issuance of $2.78 billion Eurobonds and other securities at the international capital market. Minister of Finance, Zainab Ahmed, who briefed State House journalists after the FEC meeting in Abuja, said the transaction parties are expected to advise the government on “the structure and timing, as well as, documentation for the issuance” of the Eurobonds and other securities. 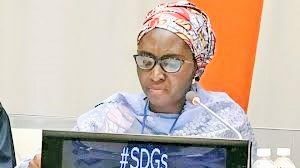 Mrs. Ahmed named the transaction parties as Citigroup Global Market Limited and Standard Chartered Bank as joint manager; FSDH Merchant Bank Limited as financial adviser; White and Case LLP, Banwo and Ighodalo as legal adviser and Africa Practice Limited as technical adviser on communication. The minister said, “consistent with government’s policy on development of infrastructure, the proceeds of the euro bond issuance will be deployed to fund critical capital projects in the 2018 Appropriation Act”. Adding that the council approved N187.4million for the purchase of 600 bulletproof vests for the Nigeria Customs Service (NCS) to fight illegal importation of rice. She said the contract has eight months delivery period. She said the approval is part of government’s commitment to the implementation of the 2018 Appropriation Act. There is a growing concern over Nigeria’s rising debt profile, which is estimated to have grown by 145 percent in the past three years, the government says there is room for more debt for Nigeria. Also speaking, Minister for Budget and Planning, Udo Udoma, said Nigeria has a sustainable debt profile. According to Mr. Udoma, “Nigeria has a sustainable debt profile with ample room to borrow more whenever we may require doing so. Nigeria runs no debt risk and the Debt Management Office carries out an annual Debt Sustainability Analysis to ensure that we stay that way,” he had said.